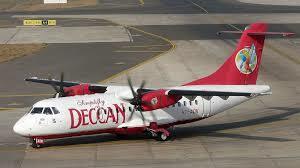 PUNE: India's first low-cost carrier Air Deccan took to the skies again on Saturday after nearly a decade, connecting Mumbai with Jalgaon in northern Maharashtra under the 'Udan' regional connectivity scheme. The maiden flight DN 181 took off from the Chhatrapati Shivaji International Airport here to Jalgaon, about 410 km to the northeast of the Maharashtra capital, an Air Deccan official said. The airline's first flight, which was supposed to take off at 12 noon was delayed and it departed only at 2.35 p.m., an airport official told pune-news.com. This was the airline's first flight after 2008, when it ceased operations post its merger with the now-defunct Kingfisher Airlines. Maharashtra's Revenue and Public Works Minister Chandrakant Patil, the Joint Director General of the Directorate General of Civil Aviation (DGCA) Lalit Gupta, the airline's Chairman and Managing Director Captain G.R. Gopinath, along with others were aboard the maiden flight, Air Deccan said in a statement. "A huge part of the country is completely unconnected by air and many parts are very poorly served. So, we wish to connect nearly 60 small towns in the coming five-six months," said Gopinath speaking on the occasion. The first flight upon reaching Jalgaon then headed to Nashik, where another operating route of the airline between Nashik and Pune was flagged off, the company said. Air Deccan, owned by Bengaluru-based aviation firm Deccan Charters, had won a bid to operate on 34 regional routes under the central government's Udan scheme, which aims to make air travel affordable and widespread in all regions of the country. The company will currently fly daily (except Mondays) between Mumbai and Jalgaon, Pune and Nashik, and Mumbai and Nashik. The airline has employed Beechcraft 1900D, an 18-passenger (with an additional crew member) twin-engine fixed-wing aircraft for operating in the regional routes. In the coming days, Air Deccan hopes to connect the towns from states like Assam, Himachal Pradesh, Punjab, Jharkhand, Maharashtra, Meghalaya, Mizoram, Tripura, Uttar Pradesh, Uttarakhand and West Bengal with the metro cities like New Delhi, Mumbai and Kolkata. The airline aims to "revolutionise" air travel in India by connecting cities that weren't accessible by air before, with price points that allow even a common man to fly. A ticket for a 90-minute Mumbai-Jalgaon flight is priced at Rs 2,250 inclusive of taxes for 50 per cent of the seats, while for the remaining seats it would vary in line with the market pricing. The airline's founder Captain Gopinath had told pune-news.com earlier that they have received the DGCA approval and would commence operations with the Mumbai-Jalgaon flight.The company which was founded in 2003 by Gopinath, a retired Indian Army captain, was popular in the country for its ticket sales where a few tickets were sold at a mere Re 1. The airline is reportedly planning to bring back the promotional Re 1 sales between its operating routes. Air Deccan had first launched its operations in August 2003 with its first flight from Bengaluru to Hubballi, about 400 km to the northwest of Bengaluru. The company after its merger with Kingfisher Airlines in 2008 had stopped operations in the same year owing to losses.